Barnes didnt have much value because there was always the significant chance that he is opting out. Last edited by sefant77; 02-07-2019 at 08:32 AM. Harrison Barnes was basically a Michael Finley-type, a good player and a hard worker, but a poor value; someone who could be the best player on a middling team, but didn't have the complete physical package to dominate games, and thus, in the fan's eye, unable to justify an exorbitant salary. Listening to Warriors analyst Jim Barnett (who clearly had a lot of regard for Barnes from his time at GS) call a GSW v. DAL game, he gave a fair assessment of Barnes' game: that he didn't have the raw speed or elite handles to consistently beat his man off the dribble, so he had had to develop alternative ways to score--the spin moves, the head fakes, and a decent though somewhat streaky 3. It looked to me like some of these compensations made him hold the ball too long and get his shot blocked a lot. It also looked like he drew a lot of uncalled fouls. How he kept his cool without blowing up and getting ejected was to be admired. I hated to see him forced to play the 4--he's not a 4, never will be. Maybe that was an attempt to create mismatches for him on the offensive end, but it always left him at a disadvantage defensively, and seemed to make the Mavericks a weaker rebounding team. I would have liked to've seen him guarding 2s more; he seemed to have enough quickness and length to defend shooters. I didn't see him as a poor fit alongside Doncic--he was doing what the team had asked him to do, which was to score. Who was he going to pass to--Matthews? Jordan? Jack Russell Jr? I think his skillset might've been more complementary and better deployed in a lineup with Doncic and Porzingis, but now we'll never know. And his contract would've always been a liability. And to the many who assure that there will be a lot of similarly skilled or better-fit players available as FAs, or available via trades? Please name names. I don't see players with comparable (let alone better) skills who will consider coming to a mid-market team like Dallas willingly. There may be better values, there may be guys who can fit. But there seems like a lot of blithe, internet-GM dismissal of a player like Barnes who transformed his game and made himself a high-level producer. This move was about dollars, not fit. If he was hurt by the way the trade happened, I'm sorry to see it. He handled it like a professional. HB seemed like a great guy and a hard-working player who improved his game and did his best at everything the coaches asked him to do, the kind that fans SHOULD appreciate and support, (same applies to Dwight Powell, although clearly he is not as skilled as Barnes) instead of some entitled kid with raw athletic skills, poor work ethic, and no understanding of the game. Maybe entitled "fans" beget entitled players? Last edited by Jack.Kerr; 02-07-2019 at 09:28 AM. Let's be honest. The Mavs didn't see Barnes as part of their future. They could have easily just re-signed the guy long term.. but they didn't want him here with Doncic and KP. He wasn't a fit..he was a poor allocation of resources. The Mavs moved him for next to nothing and cleared up space for someone that they actually want. Last edited by Murphy3; 02-07-2019 at 09:41 AM. 2) He could just opt out after this season and we'd get nothing for him other than cap. 3) We were motivated to move him and his 25mill contract just in case he opted in. The pressure was on us. Jackson showed promise (although Mavs thought Powell did too) so we got a young guy cheap. We also got a heaping handful of cap space-- enough to get a young player a max contract. I would have liked picks-- even second rounders, but the trade was solid. We got a young player that may be better here and we guaranteed that we'd have the cap space rather than going into the offseason with uncertainty. We also sent Barnes to a place where he'll be happy. I don't see a downside to this trade other than lamenting that we could have gotten more, but I'm not sure that that was even a possibility. So why didn't the Mavericks have to create a roster spot for this trade to happen? Even if Randolph is bought out or waived, it'd make sense that he would need to be on the roster. Exactly. It's definitely NOT a foregone conclusion that he opts in...esp if Sacramento likes him that much. They have the cap space to overpay him in the summer. Mavs likely allow his agent to talk to them before FA hits to do him right (much the same way the Mavericks talked to Jordan before FA hit). You then lose him for nothing. Instead, we got the 15th pick in last year's deep draft. Having thought about it over night, that isn't too bad. We did. We waived Mejri. Yes. It's my understanding that we're interested in re-signing Mejri if he clears waivers, but we waived Mejri to make this trade happen. I'm totally on board with that if nothing else happens before the deadline. Waive Randolph and hopefully re-sign Luka's buddy Mejri. We are suddenly in need of big man depth anyway. If Mejri gets picked up on waivers I wonder if we'd have any interest in bringing back Spalding? So we waived him (Mejri) during the game? He can potentially clear waivers tomorrow night then. I hope we can bring him back. Last edited by NeedlesKane; 02-07-2019 at 02:00 PM. Forget Mejri is on the team half the time. Could still use him if the Mavs are serious about the playoffs and we play big centers. Tim Cato seems to think he won’t be back... Not sure if it’s because he doesn’t think Mej will clear waivers, or because there’s likely to be several other players who get cut that might catch our eye instead. @BricePaterik: A source close to Salah Mejri confirms there’s a chance he re-signs with the team after Randolph is bought out but isn’t sure Mejri wants to come back to the Mavs. Salah was unhappy in his role and believed he deserved more than the minimal minutes he is getting. I'm gonna guess he clears waivers and no other teams come calling as he might expect. He will end up back here or nowhere IMO. Gortat just got waived, Salah might have some competition. Last edited by Underdog; 02-07-2019 at 02:23 PM. Gonna say...much rather have Gortat obviously. Let's get Powell averaging 12-10 so he opts out and tries to get that fat contract. "Please name names. I don't see players with comparable (let alone better) skills who will consider coming to a mid-market team like Dallas willingly." Nothing personal, but I am SO tired of this CRAP. Northeastern writers call us "small market" or "mid market". Asshats. Here's some news for all those NOT paying attention to the real world: the D/FW metroplex is the FOURTH largest market in the COUNTRY. (Population wise.) And will soon pass the greater Chicago area. Yes, that's right. THIRD BIGGEST MARKET IN THE COUNTRY. San Fran/Bay area? SMALL MARKET. Philly? HA! Washington DC? <Snicker> Boston? hahahahaha. You must spread some Reputation around before giving it to texasbball again. THANK YOU! I swear, I see writers say this crap all the time and it drives me insane. The other day I saw an article about the KP trade saying that the Mavs had to do something like this because they're not a "big market" like New York, Los Angeles, or.... Miami. Seriously, he said f*cking Miami. And as you mentioned, we're also one of the fastest growing metro areas in the US and will pass Chicago in the near future. Why are you unhappy with the way the Mavericks traded Barnes when he already knew he was going to get traded and decided to play in that game despite knowing that was going to happen? He didn’t have to play and there wouldn’t have been this controversy but he wanted to be a team player. DFW ranks 5th, 6th if you include Toronto's estimated market size (per Nielsen). The DFW market is about 3/4 the size of Chicago's, half the size of LA's, and about a third the size of NY's. Does that make the DFW market 'large'? No. Mid? Arguably. Upper mid? If that makes you feel better. Larger than effin' Houston's? YES! Really, that didn't seem like a controversial characterization. And then the question remains, why is there the PERCEPTION that Dallas hasn't been an attractive location for elite Free Agents? Market size? Something else? Last edited by Jack.Kerr; 02-08-2019 at 10:12 AM. I think market size as f*ck-all to do with it. It's fairly simple- they never had cap space until Dirk was old, and by then EVERY team had cap space. So we were a lousy rebuilding team with no attractive young prospects. Why would any "elite" free agent choose Dallas by then over anyone else. I don't think even ONE of them over the years stopped and said to themselves "well, I WOULD go to Dallas, but it's just not a big enough market for a huge star like me..."
EDIT- That's the actual reason. As for what the media perception as to why the Mavs haven't been attractive for free agents- yeah I think you're probably right that market size has something to do with it- but as we've discussed, I think that's flawed at best. Last edited by Thespiralgoeson; 02-08-2019 at 10:48 AM. I guess I have tough time considering being a top 5 market a "middle market." If anything your chart just reinforces to me how idiotic the whole "big market" narrative is. There are really a grand total to TWO "big" markets in all of America. New York and Los Angeles. That's it. With the exception of the Lakers- who have decades of championships to go along with their "bigness"- that never seems to translate into being some dream destination for free agents. Who was the last elite free agent the Knicks landed? Amare? He was a consolation prize after Lebron, Wade, and Bosh all joined up in Miami. I don't really see superstars lining up to join the Nets and the Clippers either. Jackson is solid depth. If Barnes was going to opt out no matter what then getting something back was better than just letting him walk. They needed salary cap space...what did you expect to get? I don't think he WAS going to opt out...that was the problem. Mavs needed that salary cap space. I guess you could argue it both ways. DFW is Top-5 ranked, but the size difference between it and the Top 3 markets is significant. Maybe it's nomenclature-- NY and LA are regarded as 'top' markets, perhaps for 'top' free agents who may also have media aspirations, and anywhere else is 'non-top'. The NY market still seems to be appealing, while the NY franchise is not. Will be interesting to see which (if any) FAs swallow hard and join the NIX. Re cities with lower market ranking (like Miami), it may also be that 'market size' is a faux-objective, proxy-metric to distinguish markets that appeal to top NBA stars in terms of lifestyle and city amenities. (It has been noted that Dallas was not on Porzingis' list of trade destination cities, however NY-Brooklyn and LA were.) In any case, I never hear Dallas referred to as a 'top' NBA market, nor do I think anyone anywhere outside of Dallas regards it as such. 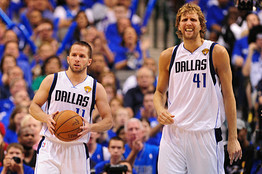 I will allow for that changing in the future, as the Mavericks team changes, and as the league changes. Doncic has a charisma and style of play that may make the Mavericks more attractive to a larger cohort of NBA players, certainly to the growing number of Euro-league players who may have connections to Doncic (and Porzingis) from international leagues. On the other hand, it may take a player with a certain type of mindset to come to a Dallas team to play 3rd banana to Doncic and Porzingis. Important thing for Mavericks fans is that the team has them both here, and that they have a year to convince Porzingis about the merits of playing in and living in Dallas. @MarcJSpearsESPN: Harrison Barnes preferred to not go into detail about the trade and said he’s about the Kings now. @MarcJSpearsESPN: Harrison Barnes seems genuinely happy to be with the Kings and says the team is shooting for the seventh spot in the playoffs. Again, there's only two "top" markets. There's New York, LA, and then there's everywhere else. That's why I've always thought it was such a silly narrative. nor do I think anyone anywhere outside of Dallas regards it as such. You are right about that- and that's the reason we were complaining. Because I don't think most of those people understand how big DFW actually is. I think sports media figures just assume that it's "flyover country." Last edited by Thespiralgoeson; 02-08-2019 at 03:44 PM.